Just about everything the US Government publishes is available to the public. Granted, browsing the GPO bookstore yields a lot of highly specialized documents like a book on how to perform pediatric surgery in hostile environments. However, there are some gems if you know where to look. If you ever wanted to have a comprehensive electronics course, the US Navy’s NEETS (Navy Electricity and Electronics Training Series) is freely available and has 24 modules that cover everything from electron flow through conductors, to tubes, to transistors and integrated circuits. There are many places you can download these in one form or another. Some of them are in HTML format. Others are in PDF, which might be easier to put on a mobile device. The Internet Archive has them, although sorting by title isn’t quite in numerical order. Some of the content is a bit dated — the computer section talks about magnetic core and bubble memory, for example, even though the latest revision we know of was in 1998. Of course, there are also references to bits of Navy gear that probably doesn’t mean much to most of us. However, things like the shift register (from module 13) you can see above haven’t changed in a few decades, so you can still learn a lot. The phase splitter in the top banner is even more timeless (you can find it in module 8). [Jorge] just finished MITx 6.002x with the fine score of 99.1%. Congratulations! We just finished reading through this review of his experience (translate) with the 14-week class and it sounds like the program is extremely well executed. For those that don’t remember, this is an intro to circuits and electronics course offered at the Massachusetts Institute of Technology. Except 6.002x is free to all as an online course (but if you actually want a certificate a fee may be involved). 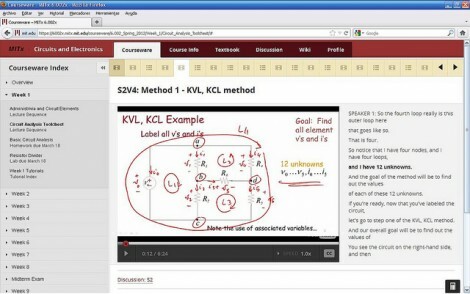 Above is one of the many screenshots which [Jorge] took of the student web interface. It looks great, and offers pretty much everything you need to complete the class. The textbook, which runs at least $65 for a paper copy, is available through the web interface as part of the course. The labs even include web demos you can use to simulate circuits and probe and measure the resulting signals and wave forms. If you have questions there is access to the teachers, but also a set of forums where you can work with other students. Perhaps most interesting is [Jorge’s] assessment of the time you will spend working on the class. He thinks that if you’re already familiar with electronics the work can be complete in about one afternoon per week. Scheduling is flexible — tests are available for one week, but once you start taking one it must be completed in 24 hours. He believes this will be offered again in the fall so keep a look out for registration to begin. The Massachusetts Institute of Technology just announced the first course offering in their new online classes program. Great news, it’s an analog design course which is right up our alley. The prototype session will be 6.002: Circuits and Electronics. If you’re a fan of our links posts you may remember hearing about the MITx program a month ago. After seeing the popularity of the Stanford program MIT is throwing their hat into the ring too. So what is this all about? How does it work and what will you learn? There’s bits of information all over the place. We recommend reading the news link at the top of this feature first. Next you should wade through the 6.002x FAQ and if you’re still interested there’s a big maroon enrollment button at the bottom of the course summary page. Whew, that’s a lot of links. Anyway, expect to spend 10 hours a week on the class; but it’s all free. Future offerings will be free as well, but MIT plans transition to a pay-for-certificate option: “students who complete the mastery requirement on MITx will be able to receive the credential for a modest fee.” If you still haven’t made up your mind take a gander at the promo clip after the jump.